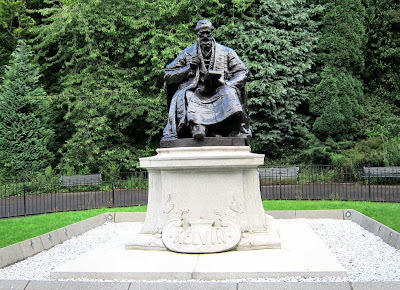 I met up with my Canadian relatives for a few days in Scotland last week, and while I was waiting for them to arrive in Glasgow I walked over to Kelvingrove Park to see the statue of Lord Kelvin pictured above. Despite his high-sounding name, Kelvin wasn’t really an aristocrat – he was born plain William Thompson, and only acquired his title at the age of 68 in recognition of his scientific achievements (he took the name Kelvin from the river that flows past Glasgow University, where he worked). Today – rightly or wrongly – Lord Kelvin is best remembered as the archetype of the arrogantly self-confident scientist who refuses to believe anything that isn’t already enshrined in a textbook. This reputation is only partly deserved. It’s true that Kelvin was overly skeptical about technological advancement – for example in 1902, the year before the Wright Brothers’ first flight, he confidently predicted that heavier-than-air flight would never be practical. However, his most famous pronouncement was actually cleverer and more perceptive than it appears at first sight. In 1900 (at the age of 76) he gave a speech suggesting that scientific theory was virtually complete except for what he described as “two little clouds in the sky”. With hindsight, given the huge revolutions in quantum theory and relativity that would turn physics on its head over the next few decades, Kelvin’s assertion looks ludicrously pompous. 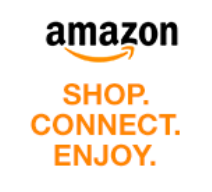 Yet the two clouds he was talking about – the Michelson-Morley experiment and the ultraviolet catastrophe (or lack thereof) – were pretty much the only phenomena known at the time which couldn’t be explained without relativity or quantum theory. So Kelvin’s only mistake was to assume that these “two little clouds” would turn out to have simple explanations, rather than domino-toppling, paradigm-shifting ones. Personally I don’t believe Lord Kelvin was the blinkered and close-minded skeptic that history makes him out to be. If you’re really looking for the patron saint of skeptics, you need to go back to the 18th century and another Scotsman – David Hume. I wrote about him in some detail five years ago (David Hume: a skeptic in the 18th century) so you can just click on that link if you want the details. To put it in a nutshell (and again this is just a personal opinion), Hume was a nasty piece of work who pioneered the aggressively hardnosed “If I haven’t seen it with my own eyes, it doesn’t exist” brand of skepticism. 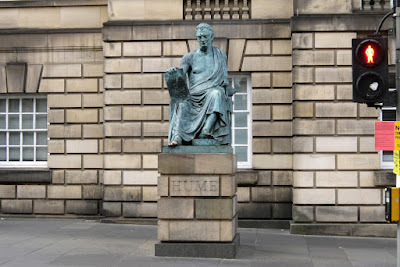 Anyway, I spotted a statue of Hume a couple of days later in the centre of Edinburgh. 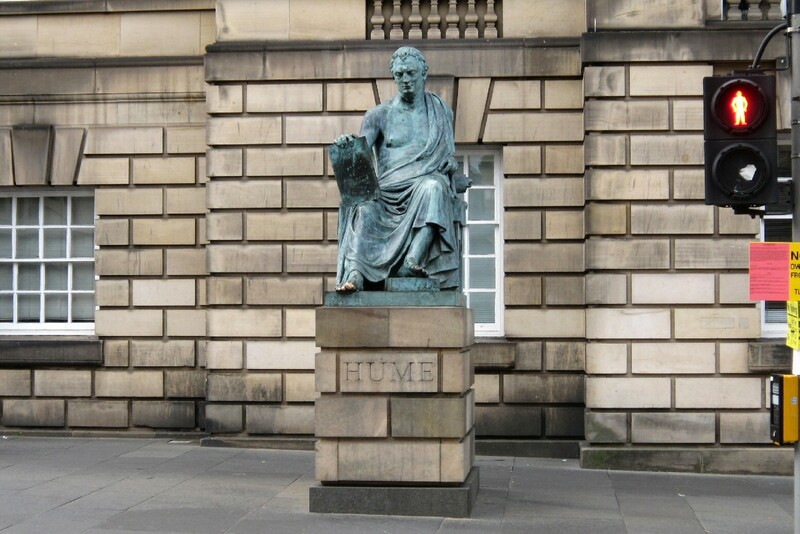 Amusingly, it shows him dressed like an arty-farty ancient Greek philosopher – somehow I doubt that it’s a depiction Hume himself would have appreciated! Thanks Kid - I know you're a Glasgow native, and much of my advance research consisted of searching for "Glasgow" on your blog. Unfortunately I only had a few hours in the town, and it's very spread out, so I didn't see everything I would have liked (that would explain why I missed the statue they put up in your honour). I flew from Bristol to Glasgow, where I met up with my relatives who are in the UK with a hire car - they are here for 18 days but I only had the energy (and finances) for 5 days! We stayed in a hotel near Crianlarich, but before we left the Glasgow area we stopped at the new Riverside Museum, which is a fascinating place if you haven't been there yet. I really liked what I saw of the centre of Glasgow. There's something about the atmosphere that is subtly different from other British towns - possibly the architecture and/or rectangular street plan - which gives it a distinctly American feel in places. You once said there were parts that looked a bit like the New York of Steve Ditko's Spider-Man, and I can see what you meant. Talking about Steve Ditko, I also went in the Kelvingrove Museum and saw the "floating heads" that you said reminded you of the cover of Blake Bell's "The World of Steve Ditko". I thought the resemblance was uncanny - possibly another Lichtenstein-style example of a mainstream artist consciously swiping from comics? There have been quite a number of big-budget movies which have used parts of Glasgow as stand-ins for places in America, so the resemblance is certainly there. (Some of these same places in Glasgow have also been used for Russia, etc.) And you could well be right about those heads at the Kelvingrove Museum, Andrew. In fact, it wouldn't surprise me at all. Haven't been to the new Riverside Museum yet (didn't even know about it in fact), but I'll pencil it in as a future destination.